The holidays are over and summer is just around the corner. I promised myself over the holidays that I would buy a window type air conditioner for my room that the kids can use for the summer when the heat gets unbearable. 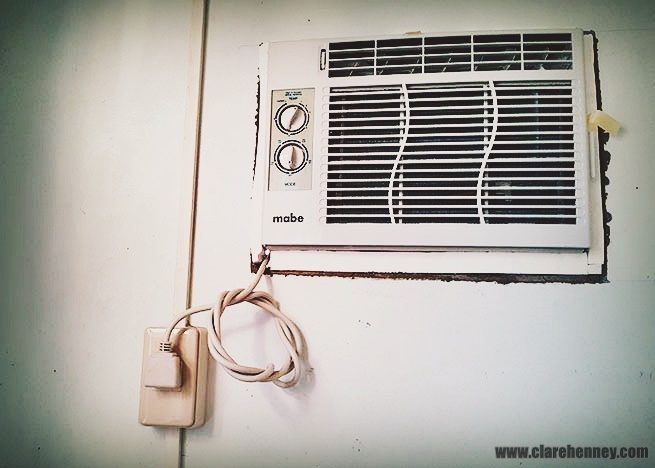 Last month I went on a lookout for a cheap, small air conditioner that I could buy. I had a feeling that air conditioning units would be expensive during the summer season so I decided to buy one over the cold holiday season. That decision paid off when I found a .6 HP window type air conditioner from GE. It cost less than P8,000.00! The AC I bought post installation. I think I need some paint for those edges. First and foremost, when buying an air conditioning unit, you must consider your budget. How much can you afford to spend? This would affect the brand and model that you can choose from. It would also mean the difference between buying a window type or a split type air conditioner or a unit that has inverter technology which would mean cheaper energy consumption but a higher purchase price. EERs are usually posted on the units when you go shopping for them. The higher the value the less energy that the unit consumes when you use it. A more expensive unit does not necessarily mean a high EER so make sure to compare EERs before you go for the known and pricier brands. Make sure to know the size/measurement of your room before you go out to buy a unit. This includes how many people will be using the room, the amount of sunlight the room gets as well as the ceiling height. Some rooms do not necessarily need a 1HP or more air conditioner. Upon consulting with the sales person at the store I visited, I found out that my room size is just right for a .6 HP unit. The BTU gives the figure for the cooling capacity of the unit. The higher the level the better the cooling capacity. For a small room size like mine, I didn’t necessarily need the high capacity ones because an air conditioner can easily cool a room that is small. Most units automatically have a one year warranty on parts and service but one thing you must remember is WHERE you that can be availed. I remember that I once purchased a less expensive appliance then later discovered that the warranty could only be availed from a service center that was too far from our home and was too much of a hassle to get repaired. Make sure to ask where the service centers are before buying! Some stores also offer installation services with your purchase, but I opted for the unit to only be delivered to our home. I got someone else to install it for me. My room didn’t have the right electrical line for an air conditioner, so I had to get someone to install the right line and install the unit on the wall of the room with a steel frame outside to support the unit. Another thing that I opted for was a manually-controlled unit. While remote controls are easier to use, from experience at work, the control of the unit sometimes becomes faulty when the battery of the remote is low. Plus, with power outages the way they are in our area, having a remote-only controlled unit means you can’t turn it off when the power shuts down. This means that the unit will automatically turn on at the level you last set it on when the power went off, which can damage the unit. I also must note that the unit that I purchased has manually controlled louvers/slats. The other unit we have at home has one that automatically swivels, which would have been the more ideal but this new unit isn’t so bad either. The room is small so there isn’t much room to swivel the air around anyway. I’ve only used the unit that I recently bought a couple of times but so far, so good. I’ve had four people sleep in my room and it has cooled fast and just right even if I haven’t used the maximum level for the cooling and thermostat yet. Good job GE! What about you? What things do you consider when buying an air conditioning unit for your home?